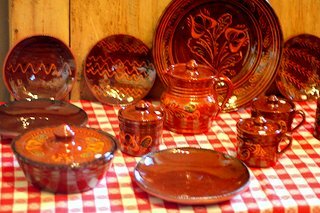 The bright and colorful Pennsylvania Dutch folk art is often expressed on pottery, painted furniture, baskets, and fabric. Images vary but they are usually connected to nature. Common folk art motifs include images of the sun, stars, birds, and flowers. Depictions of nature were thought to represent good luck and a healthy life. A common representative of Pennsylvania Dutch Folk Art is fraktur (pronounced frock-tur) which is a colorful combination of designs and words traditionally used to illustrate certificates and documents commemorating births, baptisms, marriages, and deaths. In essence fraktur is a form of decorative calligraphy which originated in medieval times to illuminate and glorify religious writing on manuscripts. The motifs of the images were created by the artist based upon the appropriateness of the occasion and the significance of the family. Some of the finest forms of fraktur were created by Mennonite and Amish artists who created their own vibrant yet restrained style. Scherenschnitte is the practice of cutting paper into complex, intricate lacy patterns. The result was used to decorate marriage and birth certificates which were later framed and displayed in the owner's home. Redware pottery was common in the 18th and early 19th century. As the name suggests, it utilizes red clay. There are two types of redware pottery. The first is basic redware. This type was made for daily use in the kitchen and usually contained very little, if any, decoration. The second type of redware pottery is that of Slipware . 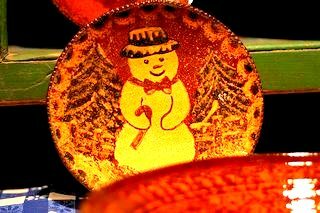 Slipware is highly decorated redware pottery which is used to commemorate special occasions. It usually takes the form of plates and jars and is used for display purposes. Sometimes, like Fraktur, the slipware contains intricate designs as well as words. Sgraffito is the practice of decorating ceramics where a design is incised into the outer coating of slip or glaze to expose the color of the underlying clay. Sgraffito often appears on redware pottery.